Apple’s WWDC event is giving us some new exciting news that few have ever thought of. Guess what? Netflix, FarmVille, and Guitar Hero have all announced that some of their newest additions to the app store. These apps have release dates throughout the summer. It is hard to imagine the timing, with AT&T announcing capped data plans, the market’s reaction to these apps will be interesting. The Netflix app makes it possible to watch streamed video available through the Netflix instant watch feature where users will be able to watch a movie on their TV or their computers and continue to watch it over their iPhone. Other interesting features include searching the netflix database, managing their DVD queues and also making personalized recommendations. FarmVille will be out by month end. No further information is available. More interesting is that The Guitar Hero app is similar to the console game but has been optimized to fit the iPhone play with the tapping and strumming mechanics. You can download the app starting today for $2.99 which will also integrate with facebook so you may share your scores. It will be all interesting to see how AT&T plans to support the new iPhone 4 with higher capacities and data rates on its already weak network. 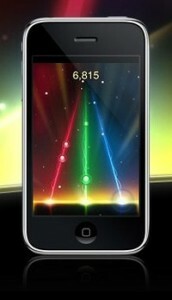 Heres a video of the guitar hero on the iphone. You can download it here.